The award was founded in honor of Dr. Cynthia D. Pitcock, a teacher at St. Mary’s, professor of medical history at the University of Arkansas and first recipient of the award. Dr. Pitcock and Bill J. Gurley are coeditors of the book “I Acted From Principle”: The Civil War Diary Of Dr. William M. McPheeters, Confederate Surgeon In The Trans-Mississippi. The 2015 Cynthia D. Pitcock Women’s History Award was presented to Dr. Miriam DeCosta-Willis Tuesday March 17, 2015 at 9:30 am at the Church of the Holy Communion, 4645 Walnut Grove Road. Dr. DeCosta-Willis, the first African-American to graduate with a Ph.D. from The Johns Hopkins University, is a woman who understands what it means to break barriers and defy the odds. She embodies much of what the Women’s and Civil Rights Movements hoped to accomplish in the last half of the twentieth century. A forty-year career in education, she has taught at LeMoyne and Owen Colleges, became the first Black faculty member at Memphis State University in 1966, chaired the Department of Romance Languages at Howard University, was named Commonwealth Professor of Spanish at George Mason University in 1989, and was Director of Graduate Studies in the Department of African American Studies at the University of Maryland, Baltimore County, from which she retired in 1999. The University of Memphis Magazine- Spring 2014 issue describes Dr. DeCosta-Willis’ journey in the article, The Defiant One by Sara Hoover. 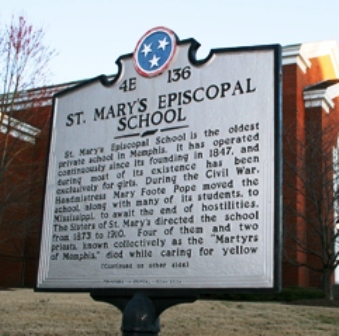 The West Tennessee Historical Society congratulates Dr. DeCosta-Willis on this award and thanks St. Mary’s for their continued recognition of women who have made significant contributions to their communities.